India is the second most populous country in the world. Acceleration in economic growth has made India among the world's ten fastest growing developing countries. Yet, the country's per capita income remains low and 26 per cent of the population live below the income poverty line. Forty seven per cent of children under three years of age are malnourished. There continues to be high incidence of child labour and out-of-school children, girls remaining particularly disadvantaged. 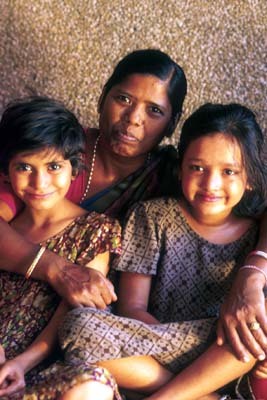 Although the caste system has been officially abolished, religious and social barriers still influence everyday life. SOS Children began working in India in 1963. Today there are 32 communities, seven of which are for Tibetan refugee children. As well as the communities where over 3000 once-destitute children now have a permanent family home, over fifty SOS welfare, educational and medical facilities also provide assistance for people in the wider community. Many hundreds of refugee children from Tibet make their way into India over the Himalayas every year. SOS Children has built seven villages (including the largest SOS Children’s Village in the world) and seven schools to help them. The schools are open to all Tibetan children, including those whose parents have survived with them. SOS Children started its first village in Leh, Ladakh early 1970s. The second SOS Children's Village for Tibetan children was built in the village of Chhorepatan near Pokhara in 1978. SOS Children's Village Mussoorie opened in 1982, a second village in Mussoorie has since been opened nearby. An SOS Children’s Village and school has been built at Bir, 50km from Dharamsala, the funds for the construction of which were raised by the Tibetans themselves, and with a contribution by the Dalai Lhama. SOS Children's Village Dharamsala for Tibetan children lies some eight kilometres outside the town at the foot of the Dhauladhar Mountains, part of the Himalayas. It has a total of 43 family houses, a community house, several auxiliary buildings and a baby house. More than 2,000 children and youths live in SOS Children's Village Dharamsala alone. SOS Children's Village Sanothimi is located on the road leading from Kathmandu to the old temple city of Bhadgaon. SOS Children's Village Sanothimi consists of 16 family houses. SOS Children also have as SOS Children's Villages for Tibetans at Gopalpur (1997). The charity built a community at Ahmedabat in 1981 in the grounds of the Shreyas Foundation in the capital of the state of Gujurat. 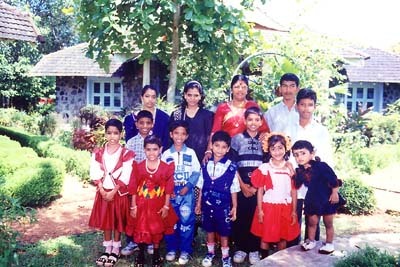 There are Four family houses; the SOS children attend the Shreyas schools. The charity has a community in Alwaye-Cochin, in the south-western state of Kerala, near to the SOS CV Trichur and 25 km from Alwaye. There are 15 family houses, three youth houses and a kindergarten. Bangalore: Built in 1989, the 16 semi-detached family houses are each home to ten children and their SOS mothers. There is a youth house and a kindergarten for 100 children. Bawana: On the outskirts of Bawana, a rapidly growing town about 30 km north of Delhi. 20 family houses, a youth house and a kindergarten. Large roofed-over areas serve as playgrounds during the rainy season, and as sleeping areas during the hot weather. Bhakatpara: About 15 km from Mangaldoi in the north-eastern state of Assam. 14 family houses, three youth houses and a kindergarten. Bhimtal In the foothills of the Himalayas, about 300km north of New Delhi, its name comes from the lake on which it is located (Bhim means big; tal, lake). 12 family houses, a youth house, kindergarten, a secondary school for 750 children and a health centre. Bhimtal is also a holiday camp for children from other SOS Children's Villages in India. Bhopal: Built following the 1984 poison-gas disaster in Bhopal in which many children were orphaned, about 8 km from the city centre. 16 family houses, two youth houses and a primary school. Bhubaneshwar: In eastern India on the shores of the Bay of Bengal in the capital of the state of Orissa. 15 family houses, a youth house and a kindergarten. Bhuj: The charity built this community following an SOS emergency relief programme after the earthquake in Gujurar in 2001 and opened in 2003. There are 14 family houses and a kindergarten. Chennai (Madras): The charity built this community about 5kms from the centre of Madras, one of India's largest cities. 15 family houses built in regional style with rooms grouped round an inner courtyard, and a youth house. Mango and palm trees provide shade during the hot season. There is a kindergarten and a primary school. as well as a medical centre which treats 30,000 patients a year. Faridabad: With only five family houses and four youth houses, Faridabad serves as an SOS mothers' training centre for all SOS mothers in India. An SOS school teaches 1400 pre-school, primary and secondary pupils from the local community, and there is also a vocational training centre. Greenfields: The first community our charity built in India, built in 1968, on the outskirts of New Delhi on the main road to Mathura. There are 20 family houses and two youth houses and a social centre providing day care, counselling, vocational training and community outreach health programmes. Guwahati: In Assam, in the town of Guwahati, surrounded by paddy fields. This community has 16 family houses and three youth houses. Hyderabad: The charity opened this centre in 2003 following an SOS Emergency Relief Programme for children sold for adoption in the area. 15 family houses and a kindergarten for 60 children. Jaipur: In a residential area of Jaipur, the capital of Rajasthan. Although a popular tourist centre known as the 'rose coloured city', social problems are immense due to the city's rapid growth in recent years. The 14 family houses are built in the traditional regional style with flat roofs used as sleeping areas during the hot weather. Jammu: On the outskirts of the old temple city of Jammu, in an area where SOS Children has run several emergency aid programmes following violent clashes between Muslims and Hindus. It has 12 family houses and a school for 1000 pupils (primary and secondary) was established in 2001. Kolkata: To the east of Kolkata, at Bidhannagar, Salt Lake City. Built by the charity in 1977 with 14 family houses and 12 youth houses established in 1991. Latur: Latur, in the central state of Maharashtra, was the epicentre of the 1993 earthquake,. An immediate SOS emergency aid programme in the area was followed by the construction of an SOS Children's Village for children orphaned in the disaster. It has 12 family houses, a youth house, a kindergarten and a social centre. Pune: On the outskirts of the city of Pune, in the state of Maharashtra, about 200 km south of Bombay. 20 family houses, each with a small courtyard, and two youth houses. There is an SOS primary school and a welfare centre for street children, called the Mumbai Centre. Rajpura: In the Punjab on the outskirts of Rajpura, about 250 km from Delhi. 14 family houses and a youth house, as well as a kindergarten. Rourkela: Opened in 2001 following an earlier SOS emergency relief programme in Rourkela for victims of the cyclone in Orissa in 1999. 12 family houses and a kindergarten. Shillong: Shillong is the capital of Meghalaya State, an area of great natural beauty in eastern India. 12 family houses with a youth house, kindergarten, kitchen gardens and training workshop. 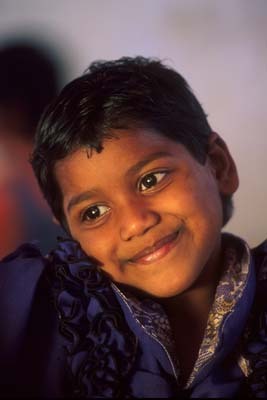 Trichur: In a predominantly Catholic area in the south-western state of Kerala, most of the children are Catholic. 17 family houses and a kindergarten. Varanasi: About 16 km from the holy city of Benares on the river Ganges, and close to the Buddhist place of pilgrimage, Sarnath. 18 family houses, two youth houses, kindergarten and a secondary school which has places for 900 pupils. Vishakhapatnam: In an area in Andhra Pradesh state, devastated by a cyclone in 1996 in which many children were orphaned, and built following an SOS emergency aid programme. 14 family houses and a kindergarten.